Thank you for all the kind words on the thrifted dresser makeover I posted the other day. Marnie, one of my awesome assistants, helped out with this project. Today, I'm going to share the steps we took to beautify this homely, thrift store dresser. 1. First, it was washed (inside and out) with dish soap and warm water and left in the sun to dry. 2. Marnie Removed the drawers and hardware placing the screws in a zip lock bag. 3. Using a rotary hand sander and fine grit sand paper the dresser and all the drawers were sanded to remove the shiny finish. (A sanding block could be used if you are really tough). **Marnie didn't have her mask on in this picture (naughty girl). I always recommend wearing a disposable mask while sanding. 4. The piece was dusted thoroughly with a damp rag to remove the dust residue. 5. 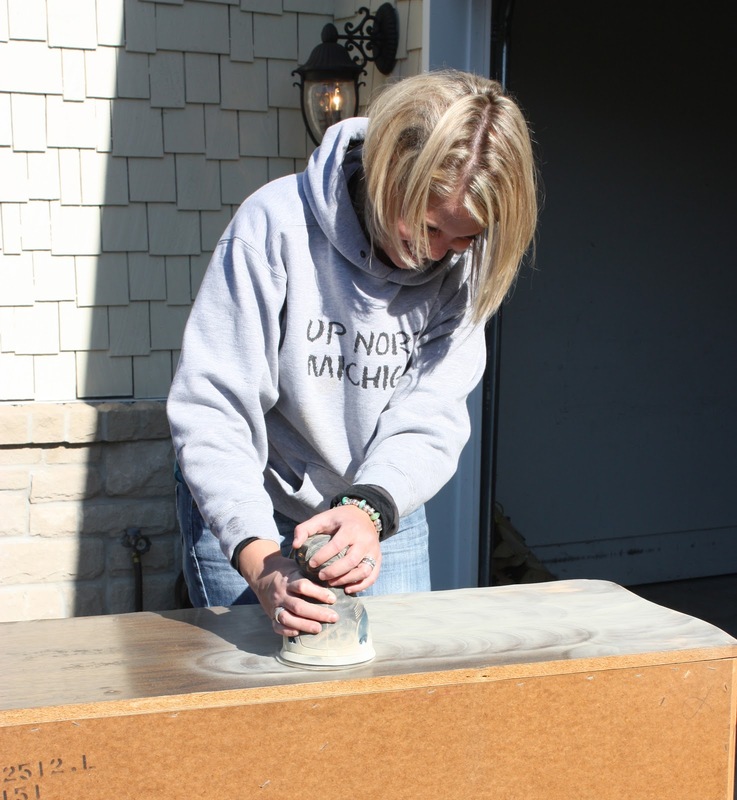 Using a foam mini-roller and Kilz2 latex primer, Marnie primed the outside of the dresser and all the drawers. 6. After the primer was completely dry, another light sanding took place (with a sanding block-no rotary sander this time) along with another dusting. 7. Using a clean foam mini-roller, two coats of white satin paint were applied, allowing the piece to dry completely between coats. As the paint was rolled on, a high quality paint brush was used to get into the detailed areas of the piece. 8. 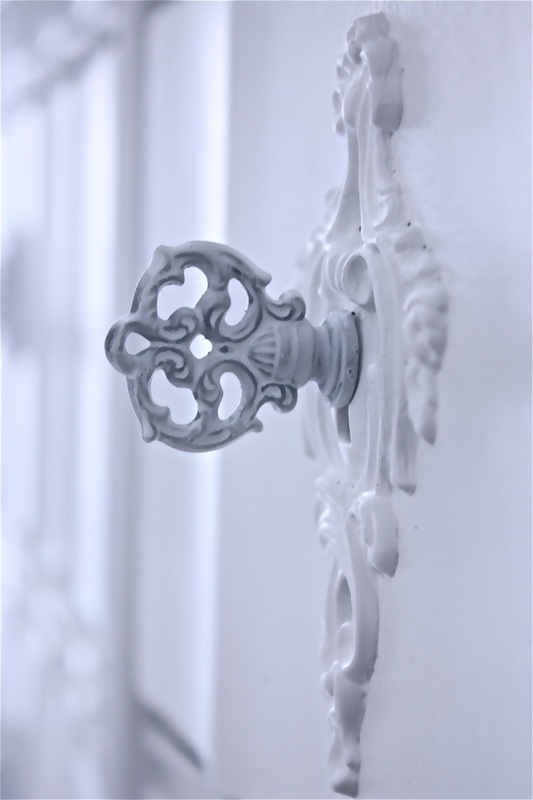 The hardware was given two light coats of Rustoleum white spray paint. 9. 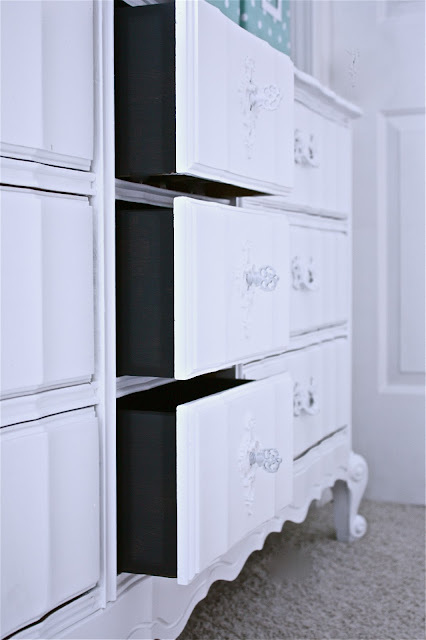 Using a paint brush, we painted the inside and sides of the drawers with black chalkboard paint, two coats. I chose chalkboard paint for two reasons, one because I love the dark, chalky finish and two so I could write messages in the sock drawers. 10. After the piece was left to dry overnight we re-assembled the hardware and wrote messages with white chalk. ~Always wear a mask while sanding to avoid filling your lungs with sanding dust. ~High quality paint brushes are worth their weight in gold. They will leave you with less brush strokes and a super-smooth finish. ~Before spray painting the hardware, read the manufacturers recommendations on the back of the paint can. It must indicate that the product is suitable for use on metal. Otherwise, the finish will not last. ~If you write your chalkboard messages within a few hours of applying the chalkboard paint, the message will be smudge-proof...just keep in mind it will also be non-eraseable. I only wrote in the sock drawers in the event that the chalk were to rub off over time, it would only be on her socks. Painting the insides of the dresser is a really great way to take the look of your finished piece to the next level. It also helps to block odors ("old smell" as my daughter refers to it) inside the drawers. I'm on a mission to find the best way to de-odorize furniture...if you have any secrets...please spill them in the comments. Beautiful dresser. I use vinegar for everything. Perhaps putting vinegar in bowls and setting inside the drawers may help with the odor. Thanks for sharing. Have a great weekend. I'm hoping you find a good way to deodorize old furniture too. I just bought a headboard from Salvation Army and it's got the "old smell". I tried washing it with vinegar/water and leaving it in the sun all day, but that didn't work. I'm afraid to paint it until the smell comes out, but maybe that's what will do the trick? I've read to put it in a room with a dehumidifier on full blast, but I've not tried that. I have had success with a few methods of deodorizing old musty furniture...including and old trunk, which many can tell you is one of the hardest things to deodorize. - Open item and set outside in the sun for a day or two. (This should be done with all smells in addition to the following methods). - Clean with 1 part vinegar/4 parts water. - Clean with a mild dish detergent. - Clean with Murphy's oil soap. - Paint the item, covering every surface to seal the smell. - Place bit of dry coffee ground inside until smell is gone. - Pat down inside and outside of object with some baking soda placed in an old sock or nylons. Wipe off with damp rag after smell is gone. - Remove any porous surfaces from item (paper, fabric, vinyl, leather, etc.) Wash separately or replace completely. - Sand finish (paint, stain, varnish, etc.) completely off, they absorb smells. Any part of the item that will absorb stain will also absorb long term smells. - Remove the veneer. Often times mold, mildew, dirt, insects, and other fungi can work their way between the veneer and the solid wood. Also, the glue used to secure the veneer will need to be completely sanded off because it absorbs odors. I've had some success with small jars or bowls of baking soda put inside drawers or cabinets. After closing the drawers or cabinet and letting them sit for a few days, all clear. I understand charcoal (not the grilling kind, the fish aquarium kind) can also work. Clean well with either vingar/water or I use Shaklee's Basic H. Then put dryer sheets in the drawers/cupboards and close them. Leave for a few days. The dryer sheets will pull the odor out, and your drawers should be left smelling like fresh laundry! Sometimes it takes a round or two, but it has worked for me with thrifted furniture in the past. Bonus use: if you've had someone who smoked (or simply smelled like smoke) in your car and the smell is lingering, put a dryer sheet or two under the seat. After a day the smoke will be gone and things will smell fresh! Thanks for the step by step. 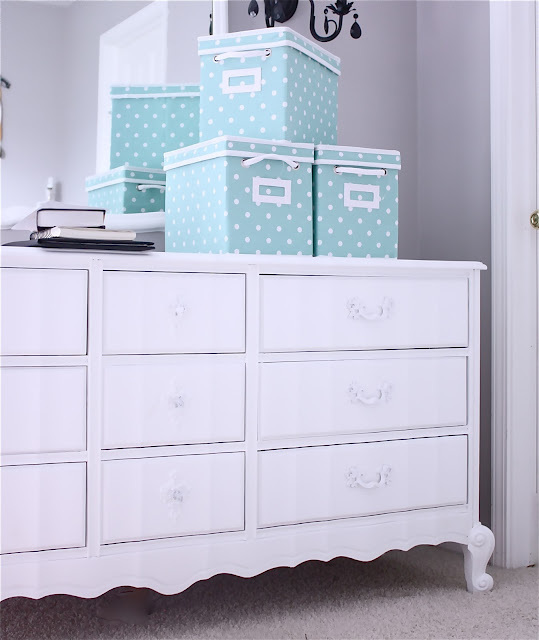 I have a very similar dresser (same colour) that I want to refinish. Yours turned out great! I always deodorize with a combo of vinegar and warm water in a spray bottle. I then mist the piece (do not saturate as wood will warp), and set it out in the sun. Once dry, an hour or so, repeat. It may take time (as in days) but eventually the smell will be gone. I have also heard that kitty litter sprinkled in the drawers helps, but I haven’t tried that yet myself. I have heard that a bowl of either coffee grounds or coffee beans (can't remember which) absorbs that "thrifted" smell. I'd love to know if it works. One of my friends taught me a sure fire way of deodorizing furniture...place a piece of charcoal (the kind you BBQ with) on a piece of tin foil and place in the drawers. It really works. 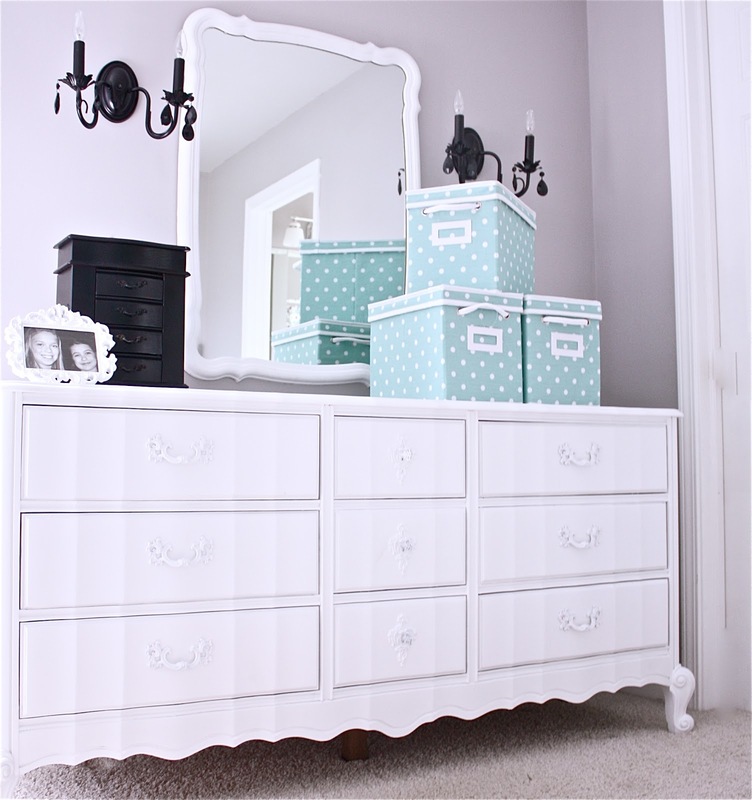 Your dresser turned out fabulous! I'm getting ready to paint one for my daughter's new baby. A while back, a friend gave me a tall dresser that smelled heavily of smoke. Someone told me to fill the drawers with wrinkled up newspaper. It took a while but the newspaper absorbed the smell. If the home remedies (lots listed above) don't do the job effectively, I have successfully used a product called Nokout odor eliminator, which might only be found online. I read about the product in a money management column and ordered some several years ago for pet odors. It was worth the investment... I've sprayed it for musty smells under the kitchen sink, on fabrics, inside furniture, on the couch (dogs), in the vents of my minivan (which poured out a weird odor each time the AC was turned on). It's not perfumed and has no odor of its own, but it took care of everything nasty! I've used the Vodka solution with success. Just buy the cheapest grocery store brand, and clean the piece like you would with soap and water. You may have to repeat depending on the severity. Let dry thoroughly. Vodka has natural anti-bacterial properties. Use a sealer (Polyurethane) on every part of the dresser that is not painted. I take the drawers out of my projects and slap the sealer on everything inside. I turn the piece over and seal the bottom and the back. Odor gone!!! I've used cat litter, newspaper, and charcoal on things you typically do not use liquid cleaners on eg trunks, wooden boxes. I just watched the movie the Help, so the words of inspiration are wonderful! !